The heart of all Quorn products is mycoprotein, vegetarian protein that is an excellent source of dietary fibre, is low in fat and saturates and contains no cholesterol or trans fats. It contains all of the amino acids that are essential for adults and is low in sodium. It also adds an unparalleled “meat like” texture to food without the use of soy. Quorn’s mycoprotein was first discovered in the 1960s when there were fears that the world’s food production would not be able cope with the expanding global population. At the time a British philanthropist and businessman, Lord Rank, led a project to discover a new source of protein for human consumption. “The quest to discover the first new food since the potato”, is how Tim Finnigan, Quorn’s Director of R&D, describes Lord Rank’s pioneering thinking. He adds that the discovery was ground-breaking at the time, as although microorganisms were used a great deal in food production – such as yeast for bread, fungi for chocolate and cheese, as well as bacteria for milk fermented products like yoghurt – this was the first time it was considered as a primary ingredient. It took 20 years of intensive development before Quorn first hit the shelves in the UK in 1985 as a ‘potato-topped pie’ sold in Sainsbury’s. It quickly became one of the country’s biggest food brands, and a household name not only in the vegetarian community but amongst all food lovers and healthy eaters. 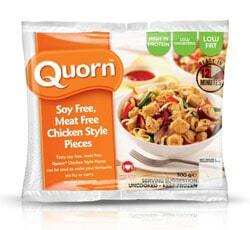 Quorn is a sustainable, healthy alternative to meat and soy products. “In today’s world we find ourselves in an even more pressing situation than they did in the 60s,” says Finnigan. “We are once again facing a food security crisis fuelled by exponential global population growth and by an ever-increasing demand for meat, especially from the East. “The world’s population is expected to increase even more dramatically, from six billion today to nine billion, by 2050. The greenhouse gases from the production of ruminant livestock (cows & sheep) is estimated to be 11% of the total global greenhouse gas emissions, and is expected to increase by 70% by 2050. The production of Quorn is claimed to be more environmentally friendly than the production of meat, and it is much more efficient. And, he notes, it is much more efficient to produce. The Quorn range offers more than 100 products, ranging from chicken-style fillets to vegetarian mince and ready-made meals, nine of which will be available when the product launches in South Africa. “With Quorn you can lead a healthy and balanced lifestyle by enjoying foods that are tasty, wholesome and, as Quorn foods are completely meat-free, much more cost effective than eating meat. Food lovers can enjoy all their favourite meals the healthy way, vegetarians can get the nutritional benefits of meat and dieters can reduce their fat and calorie intake in an enjoyable and sustainable manner,” concludes Finnigan. All Quorn products are Halaal certified, and four of the nine products in the range are certified by the Heart and Stroke Foundation. 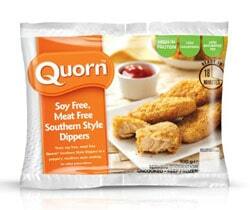 Quorn will be introduced to selected Checkers, Pick ‘n Pay, Spar and other good food stores nationwide in November 2013. For more information visit www.quorn.co.za or www.facebook.com/QuornSA or follow @QuornSA on Twitter #TastingIsBelieving.